Just because it's the 26th of December doesn't mean Christmas is over in San Diego! We are only just getting started! It's been a wild 2 days so far and it's been really very wonderful being with my family. 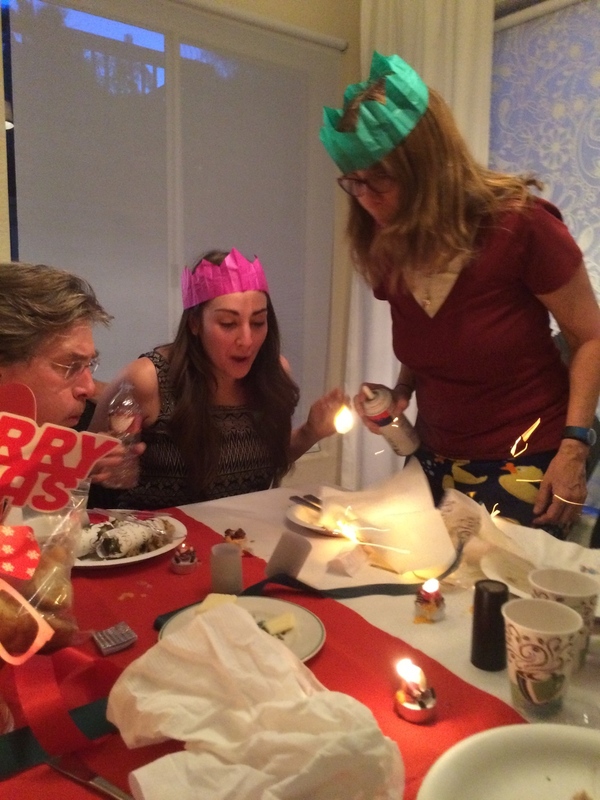 Curious what Christmas with the Roberts-Kennedy-Meisner-Heer-Morgan-Kinnaman families is like? It all started on Christmas Eve when I thought it would be a great idea to book my flight departing NYC at 6:00am which meant my sister Samantha and I had to leave our apartments around 4:00am. I also thought it would be a great idea to book a flight with a 2 hour layover in LA. We didn't land in San Diego until around 1:00pm and even though the only thing I wanted to do after that 12 hour travel day was go to bed, we instead went straight to In n Out!!!!! It's tradition to get In n Out the minute we land and that double double was probably the most delicious burger I'd ever consumed. Nothing compares to that sweet delicious burger. My sister LOVES holiday travels. The rest of the day was spent decorating Christmas cookies, eating cookie dough, enjoying our traditional Chinese dinner night, listening to my Poppy read "Twas the Night Before Christmas" and then going to bed so Santa can make magic happen! I was EXHAUSTED and ended up pooping out right after the story. It also didn't help that I was in the grips of a food coma. A little jet lagged I woke up Christmas morning pretty early. Christmas is bittersweet. It's hard not to fight the urge to just hide and feel sorry for myself. Christmas is a giant reminder that my Brother isn't here anymore. We have so many wacky traditions that still feel strange without him. It's been five years and Christmas is still hard without him. But I know he wouldn't want us sitting around feeling sorry for ourselves. Scott hated attention and he hated anyone who mope. He was always ready to just enjoy everything. Every year we have a special candle we keep lit for him that sits on our fireplace. I laid in bed for a little bit thinking about him, wishing he were here, and finally forced myself to shake it off and get out of bed to bug my sister. I found her room empty and found her watching TV with my Mommy in their room. We all jumped into bed with Mommy and watched 2 hours of Say Yes to the Dress. I haven't laid in bed with my Mommy in over a decade so being able to hang out before the insanity that is Christmas was the perfect way to start the day. Then it was time to see if we'd been naughty or nice! Every year we line up according to age (sometimes height) and we run down the stairs. This year we let my sister go first because she's always been last. Santa likes to help us with our Student Loans and instead of just cutting us a little check, he goes to Nordstrom and buys us some of the craziest and ugliest outfits in the store to return for cash. It gives us something to open and has turned into one of my absolute favorite Christmas traditions. It's so easy to get people gift cards and though gift cards are wonderful (no really I love a gift card), it's become a huge joke to get crazy wacky outfits! Then we put on the worlds most hideous fashion show. I got a huge purple fur coat, pleather leggings, a gold pleather mini skirt, a gold sequined weather that read, "I'm So Fancy," a sequined shirt that read "I'm Having A Fab Day Thanks," and a tight see through skirt! My Mom killed it in the present department. She got some of the FUNNIEST shirts and hats for my cousins. See for yourself. Then it was time for Brunch and we discovered my Mother forgot to buy bacon! It took two seperate search parties to find a grocery store that was open! 10:00 breakfast turned into 12:00 brunch. Luckily we have 10 pounds of Sees Candy dispersed throughout the house to hold us over until we could eat healthy (ish) food. Cooking is one of my favorite hobbies so I am responsible for Brunch and Christmas Dinner which keeps me very busy! While we waited for the bacon to arrive I got all the Christmas food prepped, potatoes peeled and in water, celery and onions chopped for the stuffing, and the turkey's seasoned and prepped. Then when the bacon arrived it was light speed egg and hash brown time and by some miracle everything finished at the exact same time! After brunch I got the birds in the oven and spent the rest of the day hanging out and cooking. Christmas dinner was DELICIOUS. Probably my best one yet. I have two Uncle David's in town and both are really great cooks. I put them in charge of the gravy and I have never seen a production like the one they put on. Because we didn't have time to reduce the drippings I made them a roux to thicken the gravy. First it was to salty, then it was to thick, and after much fussing, discussing, huffing, puffing, and praying they produced a perfect gravy. It was hilarious. I was thoroughly amused. Christmas dinner was a circus. I have an affinity for whipped cream and my mom grabbed it to shoot it into my mouth. In the process I knocked my napkin into a candle and almost burned the house down. After we put the fire out my Mom decided to make me look like Santa Clause with the whipped cream. I was SO sticky. But we all laughed and laughed and laughed. I ended up getting into bed at 7:30 because I was just so exhausted! I watched the end of Elf and then PASSED OUT. This morning I went on an incredible 6 mile run along the beach with my wonderful Cousin William. I love running here, we all wave at one another and the views are spectacular. Today we have the Christmas piñata, a trip to the movie theaters, and then we are wrapping up with a showing of the Interview. Tomorrow we are running around and then the next day we are going to the Zoo! How was your Christmas? Did Santa bring you anything exciting or were you naughty? Remember, even though Christmas can be a stressful and overwhelming time of year it's so important to take a minute, be with your family or friends, make memories, and laugh. Life is short and it can be hard. It's up to you to make the most of it. Until tomorrow, #RunSelfieRepeat.